Good food doesn’t begin on a store shelf with a box. It comes from a garden bursting with life, color, sounds, smells, sunshine, moisture, birds, and bees! Kids will find a variety of fruits and vegetables, and a tasty, kid-friendly recipe for each one to start a lifetime of good eating. A food for thought section presents interesting facts about each fruit and vegetable, and a how does your garden grow? 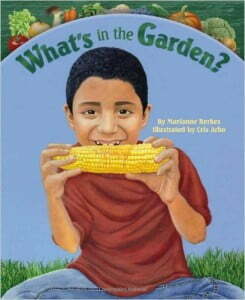 section explains facts about gardening and the parts of plants.